HDFC or the Housing Development Finance Corporation Limited is an Indian private bank offering several home loan products to its large customer base. Its home loan can be availed for the purchase of flats or constructed bungalows from private developers or the development authorities. Attractive interest rates and customized HDFC Home Loan EMI repayment options are the salient features of the loan. The bank offers a plethora of products to choose from and thus, you need to check our HDFC home loan EMI calculator if you are planning to take a home loan from the bank. It is an easy to use and accurate on result service that enables the users to check the EMI by filling the loan tenor and rate of interest in the calculator. If you are still want to know how the EMI to be paid on the loan amount is calculated, you can read all about the formula below. The EMI of HDFC Home Loan is made up of two major parts: the Principal and the Interest. In the initial stages of the loan tenor, the interest amount of the home loan is high. However, a small amount of the Principal is paid with every EMI, the interest amount reduces. At the end of the home loan tenor, the bigger portion of the Home loan EMI is the repayment of the principal amount. The EMI payment has to be made monthly, and hence it is important to know the factors that affect it. The Principal amount of Home loan: – The number one factor that affects the HDFC Home Loan is the amount you take as a loan from HDFC Bank. When the Principal amount taken by you as a loan is high, the HDFC Home Loan EMI will also be high. The minimum and maximum limit of HDFC Home loan is INR 15 Lakhs – INR 10 Crore. The Interest Rate of HDFC Home Loan: – The rate of interest charged on the HDFC Home loan has a powerful impact on the HDFC housing loan calculator. The higher the interest rate the more you have to pay the EMI. Before you take the HDFC Home Loan, make sure to check the exact rate of interest and HDFC home loan eligibility calculator so that you have a better idea of the current interest rates and other services. The tenor of the HDFC Home Loan: Another factor that determines the EMI is the tenor. It is the time allotted to the borrower by the bank to repay the loan amount in installments. When the tenor is longer the rate of interest is also high, but the EMI rate is low. This is vice versa for the short tenor of loan where the rate of interest is low but the EMI is high. Generally, the HDFC Home loans are for the maximum period of 30 Years, you can check online for the recent updates. It is really easy to use the HDFC bank home loan EMI calculator. Its design is user-friendly and anyone can use this calculator. The calculator for a home loan has been developed in a unique way so that no one faces a problem while using it. There is no complex formula involved in the process. All you need to do is give the correct inputs regarding the principal, rate of interest and tenor, and the calculator will automatically make the calculations for you. 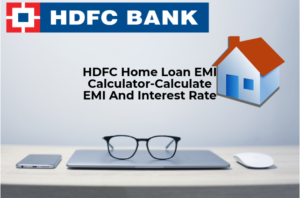 By changing the rate of interest or tenor you can get the various options of EMI this is how you can use the HDFC home loan interest rate calculator, with complete ease. Presented below is a table with the EMI For different amounts of Home Loan and tenors at ROI of 8.70%. The above table related to the HDFC housing loan EMI calculator shows you the difference between the various loan amounts taken for different tenors. For a loan amount of INR 2,500,000, the EMI for a 15-year loan period is INR 24,912 which drops drastically to INR 19,578 when the tenor is increased to 30 years. Keep in mind, even though the borrower is paying off a part of the principal amount from the first EMI, the EMI amount remains constant. This is due to the fact that the calculations are done by the banking authorities at the time of disbursing the loan to make the payment structure easier for the borrower. The Loan EMI Calculator uses the correct equations to show the EMI, wherein a larger sum of the principal amount is paid later. -Adding the income of another earning member of the family as co-applicant. -Opting for a structured repayment plan. -Presenting a steady income flow with regular savings as well as investments. -Providing details of the sources from where you are making regular additional income. -Maintaining a record of the variable salary components. -Making effort to rectify errors (if any) in the credit score. -Making repayment of ongoing loans and short terms debts. Take advantage of the HDFC home loan calculator to know what can be your prospective eligibility to get your desired loan amount for your home purchased, land purchase or home improvement needs.